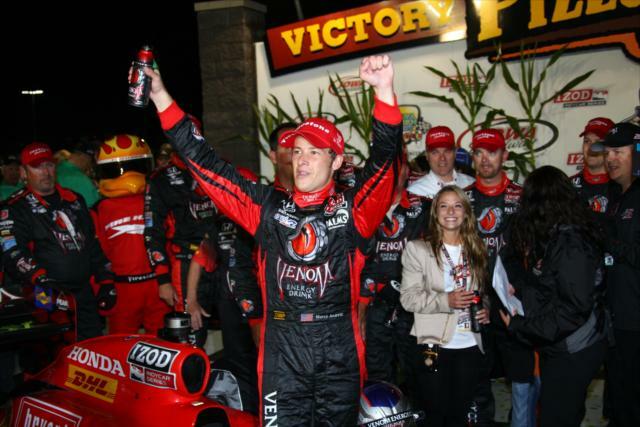 After four events in a five-race oval stretch for the 2011 IZOD INDYCAR Series, the surprising victory of part-time runner Dan Wheldon and the Bryan Herta Autosport team was followed by the status quo. The following three races were won by the well-established superteams of Penske Racing and Target/Chip Ganassi Racing. The 9th round of the IZOD INDYCAR Series tour, the 7/8th mile oval of Iowa Speedway presents the 5th race on on the initial circle track stint. Set up for 250 laps, a 25-car field of open wheel racers took grid positions for the Iowa Corn Indy 250. Starting from his first-ever IZOD INDYCAR Series pole, Japanese driver Takuma Sato led the Iowa Corn Indy 250 to an orderly beginning. Though the #5 KV Racing Technology car was able to add 8 more laps for a total of 30 laps led in 2011, a typical figure spoiled Takuma Sato's time leading at Iowa Speedway. Passing Sato on lap 8, Milwaukee 225 winner Dario Franchitti rushed his #10 Target/Chip Ganassi Racing car to the front of the field. Not only did Franchitti interrupted Sato's time at the run, the Scottish demonstrated an unwillingness to allow any driver from leading the Iowa Corn Indy 250 for almost 150 laps. As Dario Franchitti and the #10 Target/Chip Ganassi Racing team led 60% of the race distance, four cautions slowed the IZOD INDYCAR competitors. The first yellow flags during the Iowa Corn Indy 250 claimed the Dreyer & Reinbold Racing cars in varying degrees. 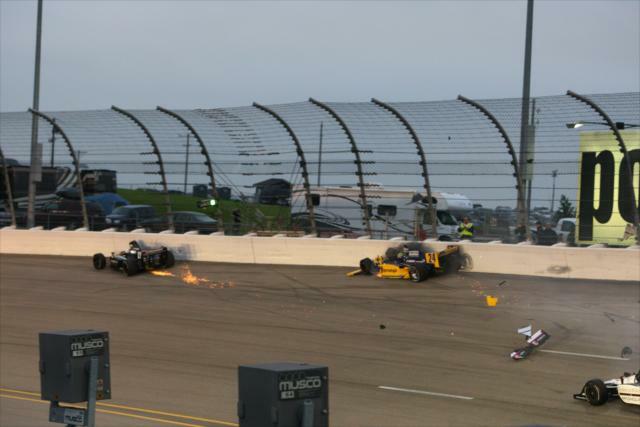 On lap 23, driver of the team's #22 car Justin Wilson was the more fortunate after spinning through in turn 2. Suffering no major damage as a result to the lose of control, the lucky British driver endured to a 12th place finish. Justin Wilson's rookie teammate Ana Beatriz was not as fortunate in the #24 car. Colliding with the #27 Andretti Autosport car driven by former Dreyer & Reinbold Racing pilot Mike Conway, Beatriz crashed hard into the turn 2 wall. Entering the race with a tie for the 2011 IZOD INDYCAR Series overall driver standings, the #10 of Dario Franchitti and the #12 Penske Racing car of Will Power were racing at Iowa Speedway knowing one driver would have to prevail as the sole points leader. The outcome for the points race would be realized on lap 91 of the Iowa Corn Indy 250. The #12 Penske Racing car of Power whacked the turn 2 wall laps. Occurring laps after a pit road accident when Will Power and Chip Ganassi Racing's Charlie Kimball's #83 vehicle. "The Verizon car was damaged after the incident in the pits and we just had a problem with the steering and it came around me. It's a tough result for us tonight." As Dario Franchitti's championship prospects in the still early 2011 IZOD INDYCAR season encountered an upswing, the #10 Target/Chip Ganassi Racing would suddenly fall under attack in the Iowa Corn Indy 250 lead. Climbing from 17th place, Andretti Autosport driver Marco Andretti had set the Target car in his gun sights taking the race's lead on lap 157. While Andretti was able to pass Franchitti, the #10 car driver quickly snatched back the 1st place position on lap 161. The final caution for the race flew on lap 185 for the race's pole sitter Takuma Sato. In post-race interview, Sato responded to the late race accident saying, "I lost at the bump in Turn 2. The tires weren't up to temperature. I'm very disappointed to finish the race this way. I feel very sorry for the team and the fans." After starting 1st on the field, Sato concluded the night in 19th place. While the KV Racing Technology #5 car was out of competition, the team's #82 car of Tony Kanaan was hovering at the front all-night long. For the Iowa Corn Indy 250, Kanaan was in position to seek redemption for possibly handling away the previous race at Milwaukee. Behind Marco Andretti on the lap 199 restart, Tony Kanaan snatched the lead four laps into the run. 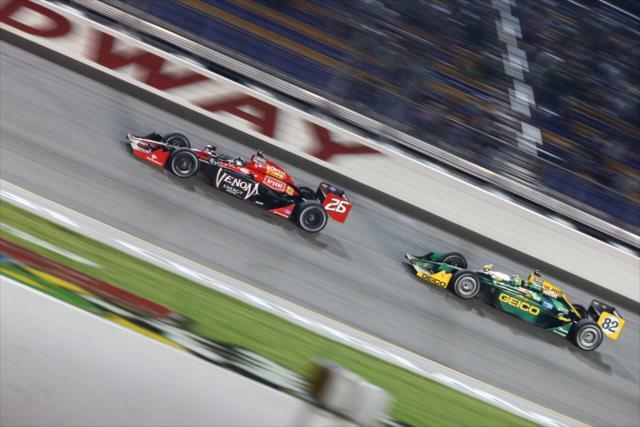 A battle between the Andretti Autosport #26 and the #82 KV Racing Technology Dallara-Hondas ensued through the final 10% of the Iowa Corn Indy 250. Thrilling the sizable Iowa Speedway crowd, Marco Andretti retook the lead from Kanaan five laps later as the former teammates for Andretti Autosport jousted through the late laps. Swapping the lead several more times, the race battle between the #82 and #26 was settled with 18 laps remaining when Marco Andretti powered by Kanaan. The moment Andretti got an advantage on the #82, the #26 aggressively skated in front of the KV Racing Technology car. This was the winning move Marco Andretti used to cross the start/finish line first for the Iowa Corn Indy 250. Somewhat unhappy with the winning pass claiming "It was pretty clean until he chopped me off. ", Tony Kanaan also confessed the 24 year-old Andretti drove a great race. The second place for the KV Racing Technology team at Iowa Speedway is the best result the organization has recorded on an IZOD INDYCAR series oval. Coming from even farther through the IZOD INDYCAR at Iowa Speedway, Scott Dixon took the 3rd and final podium position. Starting an uncharacteristic 23rd after sliding in qualifying, Dixon succeeded in outperforming his teammate Dario Franchitti who led 172 of the race's 250 laps. As Franchitti finished 5th, a 4th place result went to the impressive rookie driver JR Hildebrand. Amusingly with Hildebrand, he drove the #4 car to 4th in qualifying before he ultimated maintained his spot for the Iowa race's finish. Concluding the running order of the top-10 of the 2011 Iowa Corn Indy 250 was Ryan Briscoe, Helio Castroneves, Ryan Hunter-Reay, James Hinchcliffe and Danica Patrick.